We are pleased to inform you of some recent developments in our Analytics platform. Three major feature updates are being added to CyTRAP’s My.ComMetrics analytics platform for corporate blogs to drive higher engagement. As the leading social media statistics site, ComMetrics.com runs My.ComMetrics analytics. Our dashboard, where you can monitor your own blogs as well as your competition’s, will soon be upgraded with three important monitoring components. Can we be sure that metrics offered by Google and Yahoo are still available a year from now? Obviously we would all like to determine our returns on social marketing, based on user engagement – the more users engage with your brand´s content, the better. Based on that, we created an engagement metric called your ComMetrics Footprint, which we monitor using various statistics and data sets. However, because the Internet is in constant flux, our ComMetrics Footprint has also had to change. Remember the time when we had to exclude Technorati’s measures due to unreliability and inaccurate numbers? Then Google decided in early 2011 to virtually close its most interesting measure, Google Blog Search, so that was also excluded by necessity. But it gets worse! As October 2011 came to a close, Yahoo! InLinks took a final bow, leaving us with Google PageRank, which is often known to stay pretty steady over 12 months. Yes, Google adjusted most websites’ and blogs’ PageRanks in Fall 2011 (e.g., ours improved from 4 to 5, which immediately affected our search traffic) and again in Spring 2012 (some sites), but still. So we had to dump these measures, but several new things have also come up. First, we decided to improve our Ripple Score by expanding it to include Facebook and Google+ as well as how often your blog posts are tweeted (i.e. the new Ripple Score includes Google, Twitter AND Facebook). We have been working on My.ComMetrics for a while, but have been revamping things in the background, because our larger corporate clients needed some special features. The good news is that you will soon get access to most of these features when we release a new version by Fall 2012, if not earlier. The bad news is that you still get it for free, but only a bare-bones version. We are staunch believers in the freemium business model, which dictates that the tool is free, but you pay to play. However, with so many users wanting the extreme of loads of bells and whistles or the other extreme of bare bones, our light version is now in the process of getting a major upgrade, while the premium model has become a really fancy tool. Read on, but first, sign up for My.ComMetrics software updates and be the first to know (posts are very irregular – don’t worry, no chance of getting inundated). We give you a few more benchmarks to help you stay on top of your social media engagement efforts. For instance, the ComMetrics Headline Score is a headline-analysis algorithm that assigns a numerical weighting to each headline from 0 (worst) to 10 (best). What is your most important blog metric? Please leave a comment! Tip: Search for more My.ComMetrics sources on HowTo.ComMetrics (click to query). The author: This post was written by social media marketing and strategy expert Urs E. Gattiker, who is the Chief Technology Officer for My.ComMetrics.com – he thrives on the challenge of measuring how it all affects your bottom line. 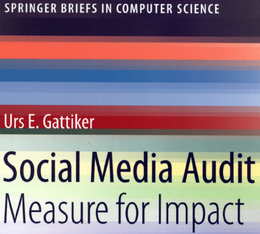 His latest book, Social Media Audit: Measure for Impact, is scheduled to appear from Springer Science Publishers in Summer, 2012. Next post: Are blog rankings just distracting?